What is the AIM Pipeline? You took the ResistAIM pledge of your support – and look what happened! – SATURDAY, May 21: Hundreds marched and demonstrated resilience with non-violent direct action on the AIM pipeline in Peekskill, with 21 arrests in the community that stopped Spectra work. – MONDAY, May 23: With our building pressure, U.S. Senators Charles Schumer and Kristen Gillibrand publicly called for Spectra to stop work. They join New York Governor Cuomo and the N.Y.S. D.E.C. in asking Spectra to stop work while an independent health and safety risk assesment is completed. 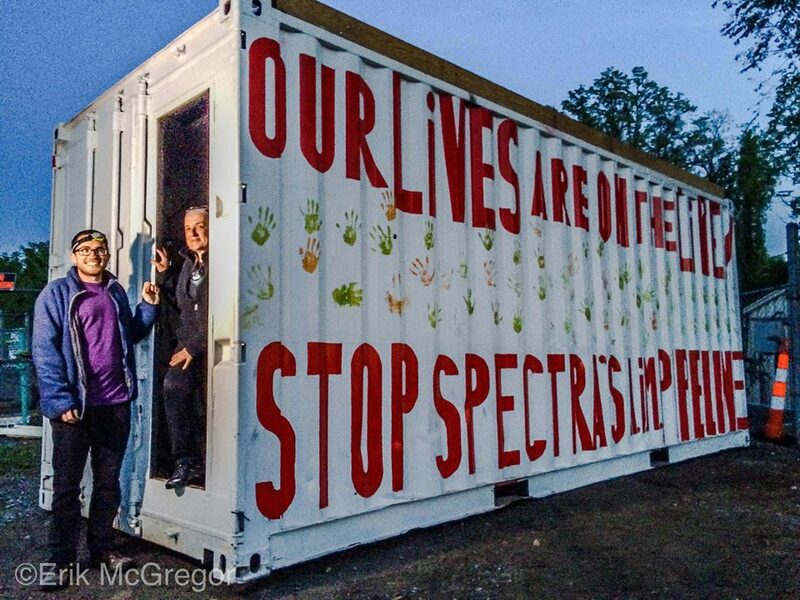 – WEDNESDAY, MAY 25: In a symbol of resilience and resistance, two ResistAIM-ers people courageously locked themselves into a renewable-energy powered, 20-ft recycled shipping-container home at the work site, directly on the AIM pipeline route. We need your support now. Donate HERE. Your donation will be used immediately for court support, renewable prop building, web site growth, targeted outreach and more of the strategies and actions, the resilience and resistance spirit building, that will allow us to #StopSpectra. We are so grateful and will keep you updated with news. Debra Lee Mahony on Welcome!